This was the hair dye I used from my previous post. I had purchased 2 boxes for my long hair and 1 and a half was enough as my hair is thin. So I had used the rest on covering places where I was paranoid that won’t colour. This isn’t my first Superdrug hair dye I’ve used. I’ve used it to do my roots when I had brown hair, dye my hair blonde and now to dye it a new colour. 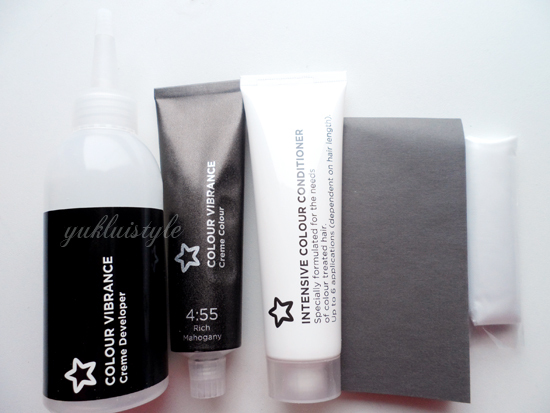 In each box, you get the creme developer, creme colour, intensive conditioner, instruction leaflet and gloves. Before dying, I had blonde hair with bright orange roots from bleaching to get an even hair colour. Wasn’t sure how it would turn out so hoped for the best. Mixing the colour was easily done and I like to shake for a few minutes to ensure everything is thoroughly mixed. Pop on the gloves which are standard ones then just apply. I always apply on the top first and completely cover it, then slather on the rest without a certain technique. Not the best but it works for me. The consistency of the dye is a tad on the runny side but it is easy to control and spread on the hair. This hair dye contains ammonia and you do get a strong smell of it. It is bearable but some may not like it. Put the hair in a bun and cover it with a plastic bag. Again, this is to reduce the smell as I had family around and helps the dye develop better. Left the dye in for the recommended time, 30 minutes and washed it out afterwards. I did notice that it did take ages for the water to become clear. Washed hair with shampoo and used the conditioner included. I love their conditioner! Leaves my hair feeling soft and not dry, doesn’t weigh my hair down, and gives a great shine. Smells nice too. Their conditioner is the best condition included in a hair dye product. A tube lasts me aroun 5-6 weeks depending on my hair length as this is used once a week. Wet hair makes the colour look dark so after blowdrying, I was amazed at how rich this colour actually was. I couldn’t see the box swatches properly in the lighting in Superdrugs. The instructions did say that with blonde hair, it’ll give me more vibrant results and I never knew that it’d be this vibrant! This is a wonderful colour. It is evenly coloured and looks great overall! This had left my hair feeling soft and non drying. I really do recommend Superdrug’s own brand hair dyes! I’ve always had positive results with them. Another positive point is the price, CHEAP and AFFORDABLE! This has a red, purple hue. Can be described as plum, and very rich mahogany. I’ve only dyed it recently and really do hope this hair colour will last ages. Previous post shows close up of the before and after hair colour. did you also dye your eyebrows?